American energy independence, rising health-care costs, environmental degradation and national security. What do all these things have in common? A troubled relationship with the food we eat and how it’s grown, at least according to best-selling author, veteran food journalist and sustainability spokesman Michael Pollan. 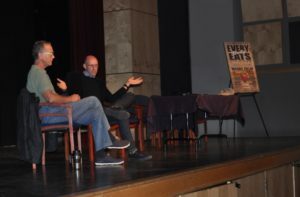 Pollan addressed a sold-out crowd at Santa Cruz High School on Oct. 25 as the featured speaker in a panel discussion on food and its future. Titled “Every Body Eats,” the discussion was sponsored by Slowcoast and Sustainable Santa Cruz with all proceeds going to the Homeless Garden Project (HGP), a local nonprofit. The night’s first topic was Proposition 37, the controversial ballot initiative that would implement mandatory labeling on all food products containing genetically modified organisms (GMO) in California. Pollan said Prop 37 could change that. Pollan and Robbins both acknowledged that the fate of the proposition is far from certain. A recent poll showed only 44 percent of California voters support the measure while 42 percent oppose it, a far cry from the 2–1 margin it enjoyed as recently as September. At the heart of that change is an “advertising blitz,” according to the the LA times, against the proposition by its detractors. So far the “No on 37” campaign has outspent Prop 37’s supporters $41 million to $7 million. The panelists also discussed what they see as the broad shortcomings of the U.S. industrial agriculture system and its consequences. Pollan began his critique with the vast farms specializing in single crops that form the backbone of the industrial agricultural system, a recent development that he views as a long-term challenge to the stability of the system. Robbins emphasized the inequity of distribution within the globalized food system, noting that roughly one billion people worldwide are underfed while another one billion are overweight. Pollan said the next president could take a major step toward addressing each of these issues by shifting government support away from industrial agriculture and toward local, sustainable alternatives. Use less machinery, petroleum-based fertilizers and pesticides in our agriculture, Pollan said, and the U.S. could significantly decrease its dependence on oil. Pollan added that the U.S. agricultural system currently uses more fossil fuel than any sector of the economy other than cars. By promoting a healthier diet centered around fresh produce and removing subsidies that artificially deflate the price of processed food, Pollan said the U.S. could make progress in combating health care costs, the bulk of which are caused by preventable diseases linked to diet and lifestyle. Pollan said although the government can provide important incentives for moving the U.S. in the direction he described, in the end the task will ultimately fall upon the shoulders of the next generation. Jamie Smith, manager of Food Services and Nutrition for Santa Cruz city schools, said he is already hopeful change is taking root. Since being hired in 2009 Smith has eliminated processed foods from the cafeterias and switched them to cooking from scratch, and has since witnessed an upsurge of interest among students in cooking and growing food.